Ruth the kind Moabite was a selfless woman who accepted God and the Israelite people as her own. Her story started during the time of famine, when a family was forced to leave Bethlehem. Elimelech and his wife, Naomi, together with their two sons, Mahlon and Chilion, immigrated to the nearby country of Moab. The two sons got married to Moabite woman – Mahlon married Ruth, and Chilion married Orpah. Elimelech and his two sons died, leaving their wives as widows with no help. Naomi decided to return to Bethlehem, and urged her daughter-in-laws to return to their own mothers and remarry. 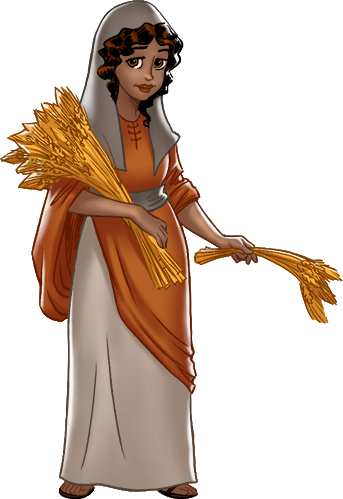 Orpah half-heartedly left, while Ruth the kind Moabite refused to, declaring her faithfulness to Naomi despite the hardships that awaited them. Back in Bethlehem, Ruth asked Naomi’s permission to glean the fields, which she granted. Now, the part of the field Ruth worked belonged to Boaz, a relative of Elimelech (her father-in-law). Boaz inquired who she was and permitted Ruth to glean the fields after his maidens and drink from the vessels when she got thirsty. Boaz also commanded the young men not to touch her. After some time had passed, Naomi encouraged Ruth the kind Moabite to wash and anoint herself and lie at the feet of Boaz after he had eaten and was drunk one evening. Because Ruth was a beautiful and strong woman of character, Boaz was taken by her – he chose to purchase all the holdings of Elimelech and took Ruth to be his wife.